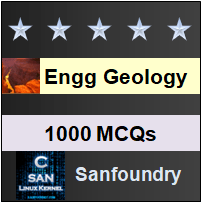 This set of Engineering Geology Multiple Choice Questions & Answers (MCQs) focuses on “Classification of Sedimentary Rocks”. Explanation: The mechanically formed sedimentary rocks undergo the processes like- weathering, erosion, transport, deposition and diagenesis. Oxidation is considered under to be a non-clastic cause. 2. What is the size required for a particle to be called gravel? Explanation: All sediments and clastic fragments of rocks above the size of 2 mm irrespective of their composition and shape are broadly termed as gravels. 3. What is not true about silts? Explanation: Silts are very fine-sized particles of varying composition lying in the range 1/16 mm and 1/256 mm. they are further divided into three categories, fine, medium and coarse. The silts are the major constituents of rocks known as shales. 4. What is the average grain size of rudaceous rocks? Explanation: Rudites or rudaceous rocks include all coarse-grained rocks of heterogeneous composition. The average grain size of the constituents in rudites is greater than 2 mm. 5. Give an example for rudaceous rock. Explanation: In rudaceous rocks gravels are held together in the form of a rock by a natural cementing material. Breccias and conglomerates are important examples of rudites. Explanation: Rudites or rudaceous rocks are also called as psephites. Rudites are made up of boulders, cobbles and pebbles collectively known as gravels. Explanation: The arenites are also called as arenaceous rocks. These are made up of sediments of sand grade (2mm-1/16 mm). Explanation: In a particular rock, the sand grains of particular size range may be predominating giving rise to coarse, medium and fine arenites. Sandstones, greywackes and arkoses are common types of arenites. 9. Which of the following are finest grain sized? Explanation: Argillaceous rocks are also called as lutites. Lutites may be defined as sedimentary rocks of the finest grain-size. They are made up of silt and clay grades. 10. A clastic rock might not have more than one grade. State true or false. Explanation: Many a times a clastic rock may be made of sediments of more than one grade. It is the dominant grade that is taken into consideration while classifying the rock. Explanation:The non-clastic rocks are also called non-detrital rocks. They are generally homogeneous in character, fine-grained in particle size and varying in chemical composition. 12. Pick the type of sedimentary not belonging to chemically formed rocks. Explanation: The sedimentary rocks under the chemically formed deposits are Siliceous deposits, carbonate deposits, ferruginous, phosphatic and evaporites.